This series is all about listening to your body and the more you know about how your body functions the more confident you’ll be interpreting what YOUR body is trying to tell you. When you have body wisdom you’ll have vibrant health no matter what’s going on because you’re always listening to the expert - your body! This episode is #1 in the Body Wisdom Series. If you’ve been in my crowd for any length of time you already know how much I love being able to chat with all of you and ask you about what’s going on with your health. And that’s what inspired this Body Wisdom Series. I named it Body Wisdom because I really believe that is the ONLY path to truly looking and feeling your best, and that’s listening and being able to interpret what YOUR body is trying to tell you. When you have body wisdom you’ll have vibrant health no matter what’s going on because you’re always listening to the expert - your body! Plus I have a special guest joining me - Natasha is a fitness and nutrition expert and has 15 years of working with women. No matter where you are on your health journey there is something here for you. Enjoy! Are you subscribed to my podcast? If you’re not, I want to encourage you to do that today so you don’t miss any episodes. If you’re not subscribed there’s a good chance you’ll miss out on any bonus episodes I add. Click here to subscribe on iTunes now! Now if you’re feeling extra loving, I would be really grateful if you left me a review over on iTunes too. Those reviews help other people find my podcast and they’re also fun for me to go in and read. Just click here to review, select “Ratings and Reviews” and “Write a Review” and let me know what your favorite part of the podcast is. Thank you! Today we’re wrapping up our 5-part Eat Right Series with another 15 mistakes we make eating right. Remember whether you’re making a few mistakes or all of them doesn’t matter, what we’re looking for is insight into what gets in the way of you eating right. Over the course of the Eat Right Series I’ve received many messages and to wrap it all up I wanted to address the questions, obstacles and roadblocks you’ve been sharing with me behind the scenes. We’ll dig into willpower, self sabotage plus when it comes to eating right there are no quick fixes BUT I am going to share the ONE thing that comes close. This one change is a great starting point to give you some early momentum because you will notice the results in only a few days - it’s an Eat Right Quickstart. Prefer to read the transcript? Today we’re starting to wrap up our Eat Right Series in a 2-part episode. One of the interesting lessons I’ve witnessed over the years is that it is impossible to get where you want to go without first knowing where you already are. In order to use a GPS you need the destination and your current location. It’s no different with eating right, you need to know where you might be making mistakes before you can fix them. 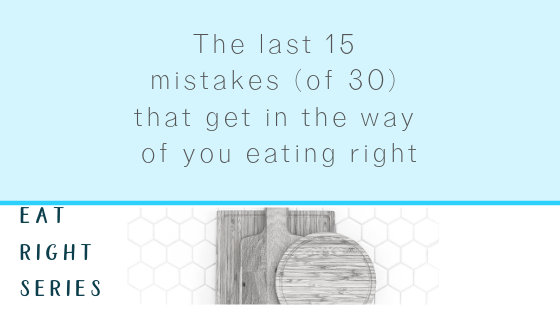 So today we’re looking at the first 15 (of 30) mistakes we make eating right. When it comes to looking and feeling your very best, there is one goal that seems to be on everyone’s list and that is eating right. We all know on a deep level that what we eat has a dramatic effect on how we look and feel but the overwhelming amount of information out there can stop us in our tracks. And what’s worse is that so much of it is conflicting, confusing, and potentially damaging. What the heck do we eat to look and feel our best, to protect our health and prevent doing ourselves harm? Episode 3: Gut in a Rut? Having a healthy gut is the strongest foundation for your health. But how do you know if your gut is healthy? Well the good news is, you get a (hopefully daily) report card to tell you exactly how well the food you eat is creating the healthy body you want. Today’s episode is taken from one of my most popular live workshops called Gut in a Rut. There is A LOT of information in this episode and you’ll want to listen more than once. The workbook and all the slides are available when you go to the episode #3 extras at www.drkristinenewman.com/healthier. I suggest listening at least once with both in front of you. We covered so much information in this jam-packed, fast-moving workshop. And it will definitely have you covered when it comes to keeping your gut healthy (and out of a rut). It seems like there is no shortage of new + noteworthy health trends. But how do you know what’s worth your time, energy and hard earned cash? 5 to Thrive is a quarterly series created to bring you some of the trending health habits making the news. I’ll dig deep into 5 hot health trends and give you all the information you need to decide if it’s right for you…or not. ** This is a 5 day email series so make sure you’re getting my emails (www.drkristinenewman.com/healthier) so that you don’t miss out on the next 5 to Thrive series! If you’ve been hearing about these and wondering if any of them are right for you, here’s your answer! Healthier has been in the works, well, as you’ll hear in this short intro episode, since July 12, 2014. In a time when we can find anything online health information is at our fingertips. And yet how do you know that what you’re hearing is factual? Your health is not a guessing game. The decisions you make can have a lasting effect on how you look and feel. Plus the amount of information is overwhelming. And the experts seem to constantly contradict one another. That’s why it’s never been more important for you to be in charge of your health. How do you do that? You have to learn what works, and what doesn’t work, for you, your body, and your life. No one is better positioned to be an expert in you, than you are. My mission is to share the foundations of health and how your body works so that you can be informed and the final vote on what you need. By starting with the foundations you can gather all the information you need to not only make informed decisions but also to take everything you know about your body with you to your healthcare practitioners. Having been in private practice for over 15 years I can tell you that the more you can tell us the better we can help you. Healthier is all about sharing these fundamentals and giving you the tools to study yourself. And in the process follow my 3 step path to being healthier. After nearly 2 decades of working with women who want to be healthier I can honestly say it’s not a lack of knowing what you should be doing. It’s not knowing the very next best steps and the right order. It’s trying to get from A-Z instead of A-B. Once you have a clear strategy you’re on your way. But it isn’t enough to just know what to do. You need to follow through. And this is where most of us struggle. Starting strong and fizzling out, jumping from one thing to another thing and never getting any real traction, giving up. Here’s the truth: accountability is not something you either have or don’t, it’s a skill you need to learn and strengthen. And without it, you’re stuck spinning your wheels, frustrated and baffled as to why you don’t just do the things that make you feel better. The there’s the busy-ness of life and all the competing priorities, daily obstacles and hurdles that get in the way of prioritizing your health. You need a way to stay at the top of your to-do list, not constantly sliding down to the forgotten bottom. When you have these 3 things (1) strategy, (2) accountability, and (3) a plan that’s when you’ll be healthier. Welcome, this podcast is all about guiding you along this 3 step path.